WhatsApp, a popular and most widely used instant messaging app with almost 800 million active users. Apart from messaging, we are familiar to see many forwarded messages like share this to get good luck and other hoax messages which include sharing this to get WhatsApp free for lifetime, etc. Hold on! I’ve made a big collection of Most Hilarious Hoax WhatsApp Texts and Forwarded messages, I’m sure you’ve encountered at least one among the following hoax messages if you’re active on WhatsApp. By the way, all the below-attached screenshots are truly received messages and captured through WhatsApp Web. All the messages that I’ve attached really don’t work and are completely fake. Wow! If you send this message to 5 persons, the emoticon opens up automatically and gives you its heart. Many of us know Indian Cricketer Virat Kohli, and Bollywood Actress Anushka Sharma are in a relationship and Yuvraj Singh is an Indian Batsman who doesn’t have any interference between them. I’m not sure what happens after forwarding this message LOL! 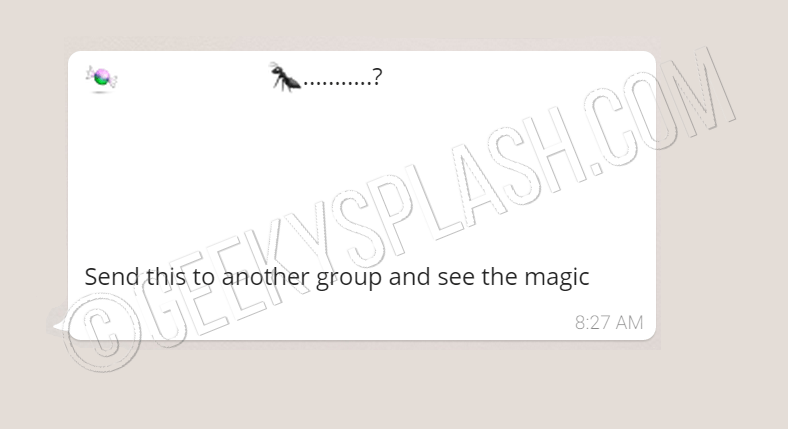 Text written below says that if you forward this message to 2 groups, you’ll see the magic . This guy Karthik lost his eyes and needed money for his operation, by sharing this message he will get a penny for each forward. But please! Somebody tell me how a blind person typed this message and by what logic he will get paid? You know what? NASA had joined WhatsApp and busy in forwarding SMS spirals that change positions of Apple emoticons for each forward. #5 WhatsApp charges your Mobile! Send this message to two groups and WhatsApp will automatically charge your mobile. Don’t forward this in too many groups.Your mobile may be overcharged and may lead to the expansion of your battery! Haha ! Indian Medical Association – IMA announced that these cool drinks contain pesticides. This logic makes me feel that almost 80% of Indians are already victims of Cancer! Save Indians. Ah! I’m sure almost many of us are familiar with this message, but you may encounter the same text with a different cool drink like Coca Cola, Maaza, Pepsi, etc. which were contaminated by a worker of the company. What ever the drink may be, it is always telecasted yesterday in NDTV. If you hate Uninor, say it as Pakistan Company and forward it to Indians to create conflicts between each other. You will get a 75.75 Rs. Recharge for no reason if you share this. By the way, Uninor isn’t a Pakistan company! Not sure whether these mobile numbers work in reality or not but the Recharge hoax makes this a chain message and Indian Prime Minister Narendra Modi is responsible for this magic! This Modi hoax message really went viral and made Telegram App top on charts in the Google PlayStore.By the way, Telegram is run by a German based company and doesn’t belong to India. Narendra Modi wants to see the loss of Indian Telecom Companies to reduce Data Charges. Many people took this so seriously on 31 August 2014 as Prime Minister advised to do so. Share this to groups and see how the ant gets the candy! Sharing this long proverb gives you Unlimited Luck and makes you unlucky if you don’t share it within 96 hours. LUCK Delivered VIA MAIL or INTERNET within 4 days , truly based on your convenience. Chinese Proverb originated from Netherlands, sent from South Africa. Around the globe 8 times! The first man who received this proverb ( Never mind who was the one who sent him ) made 20 copies of the proverb for no reason. This message passes a fake news which people believed Ebola reached India. Varun Pulyani wasn’t a director of WhatsApp. However, if you share this message you’ll see Facebook logo instead of WhatsApp as they sold it and Recharge Hoax as a bonus by the way. Sanjana Nitousha, Vice President of WhatsApp, Interesting .. isn’t it? Glad to see her forwarded message on my phone by the way. So Mark Zuckerberg started to make WhatsApp to another Facebook. Share it as soon as possible to like and comment on your pals WhatsApp profile pictures !! Don’t forget see the emoticon near your status.BTW Sanjana Nitousha isn’t an employee of Whatsapp. I didn’t share this! But yet I’m getting blue ticks on my WhatsApp which is not in Blue color. I’m worried! I didn’t find this in today’s paper at least. Damn blue ticks !! Share this to get Green ticks instead. As usual forwarding, this message will make it activate without any update. MSN ( a web portal of Microsoft ) owned WhatsApp earlier than Facebook and has only space for 530 accounts. What a pity! Enjoying WhatsApp calling? 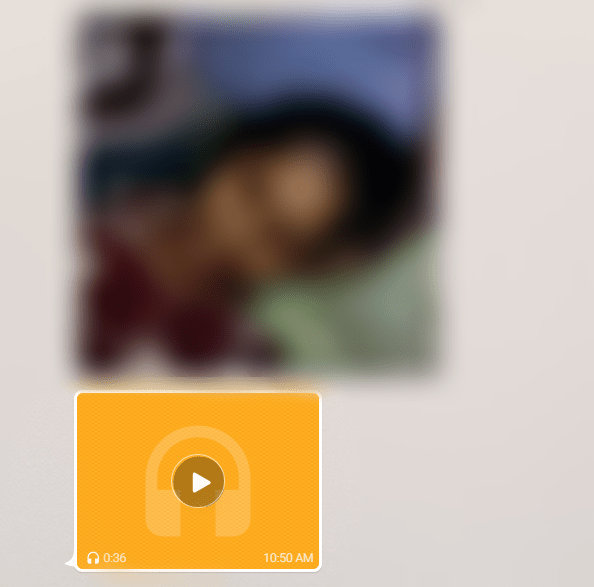 Get WhatsApp Video Calling now just by sharing this amazing hoax message. 2 minutes of silence for English. 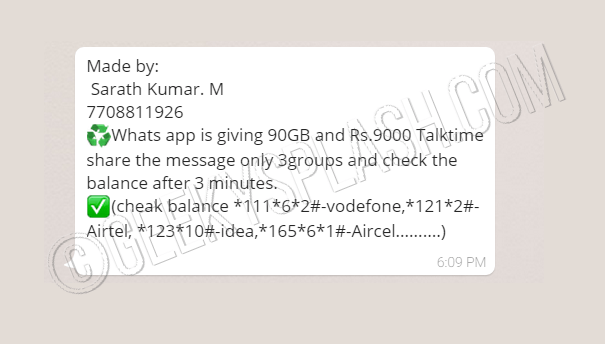 This message is made by Sarath Kumar who discovered that WhatsApp is giving 90GB and Rs.9000 talk time for no reason. If you believe in this hoax message check your balance with the provided USSD codes, you will be gifted with a Value Added Services on your mobile that drinks your balance. Greatest pal I’ve ever seen. 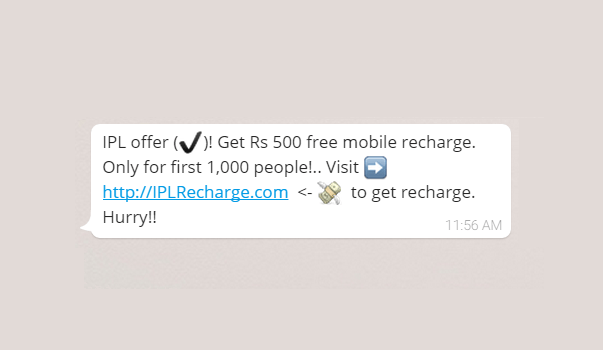 Paytm offers recharge from another website. Oh! Great to hear that. Don’t waste your time watching IPL buddies. Get some recharge for no reason. Tada! 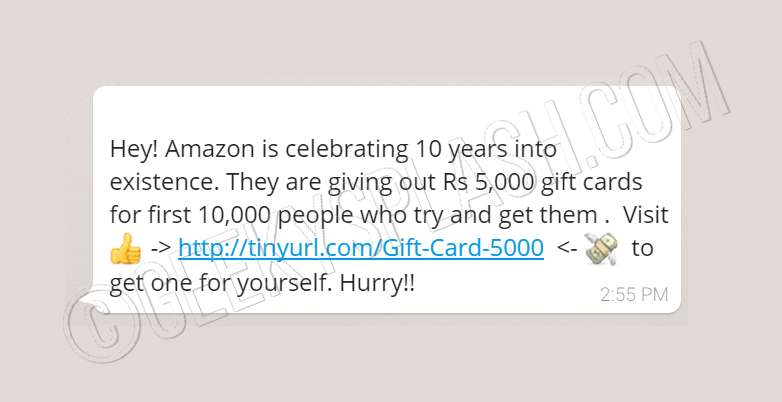 It’s time for Amazon to give some gift cards of a Rs.5000 for first 10K people which Amazon is giving up 50 Million just for celebrating 10 year anniversary. Grab it! But I’m sorry to say that Amazon started 20 years ago. 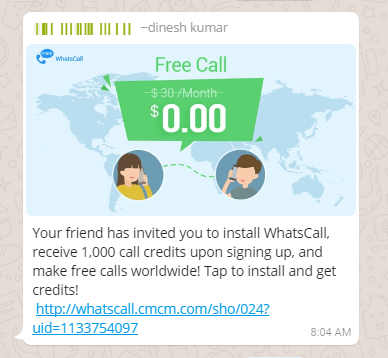 Using WhatsApp Calling? Stop using and user this WhatsCall. This is a lame hoax man! Please do read this message. You can use WhatsApp without the Internet ! ( Damn) I just threw away my WiFi router out of my house after reading this , LOL . Beware Pals ! 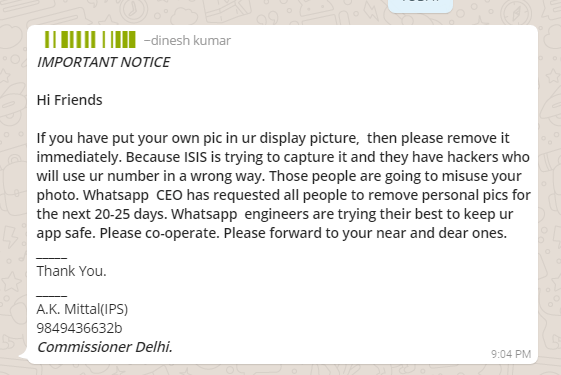 ISIS Terrorists are busy getting your WhatsApp DP’s. Reminding you that its a fake message. This is the worst hoax message I’ve ever seen. This comes up with an image along with a voice of a guy who speaks in our regional language stating that the one in the above is suffering from a disease and need some money for surgery. 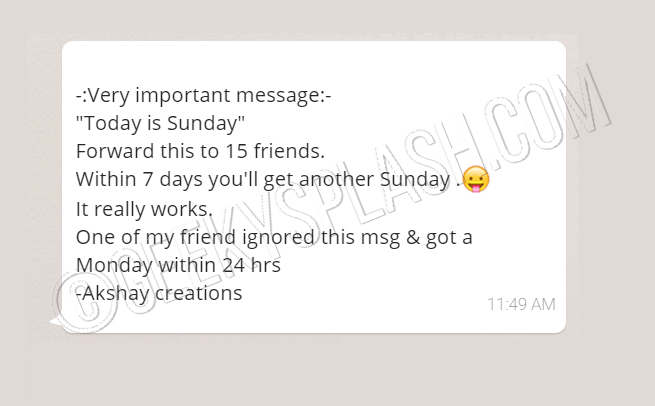 You just need to share this message and WhatsApp pays 8 pennies for each forwarded message. Believe me or not I’ve seen tens of this kind of messages with the same concept with a different picture of people, which even include infants with a same stupid voice message stating that WhatsApp pays for these forwards. I’ve seen some hilarious forwarded messages which make fun of these hoaxes. Here are the few.